We have a big trip coming up at the end of the month. Our first show in New York City. Actually, our first show anywhere outside of Los Angeles. A two-day event exploring the idea of underground publishing. But for now, I only want to talk about one of the most awesome people in our city, Jessica Ceballos, and the great work she is doing. We recently saw her at the release party for RA #3. She was one of the featured writers in it. It was a great intimate event at one of the nicest lofts in downtown. Jessica read some of her poems. She is a terrific writer. During the reception, while drinking wine and eating chips, she started telling us about the event she’d recently hosted. Even in telling us about it, we could tell how much Jessica was still moved by how it had all gone down. I had wanted to attend it because, well, for a couple of reasons. One, not only was Jessica hosting the event, my good friend and powerhouse poet Luivette Resto was going to be reading. And two, I couldn’t quite picture exactly how the event was going to play out and I wanted to experience it! 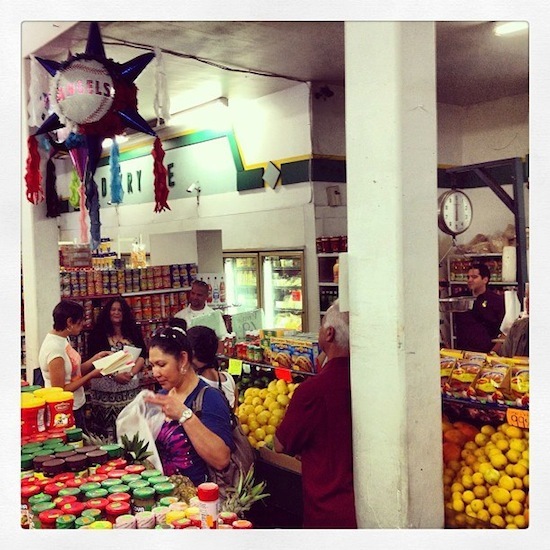 The poetry reading was held on April 27th at Guerrero’s Market in Highland Park, in the produce section overlooking the butcher counter. In addition to Luivette, the other poets were Gloria Enedina Alvarez, Yago Cura, Ryan Nance and Julio The Conga Poet. We couldn’t agree more with that sentiment about community and non-traditional public spaces. As we’ve been reporting to you, we have been planning so many things, hatching so many ideas, to take the book/bookstore on the road. This is where it goes beyond commerce and to something more elusive—making literature an essential fabric of a community’s well being. But really, these are things we want to do. Jessica is doing this right now. 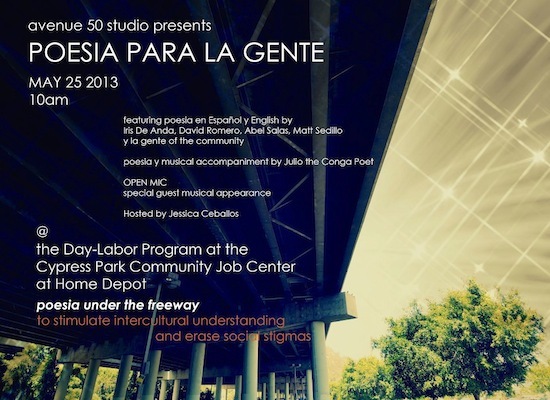 The poetry and produce event at Guerrero’s was part of the Poesia Para La Gente that she programs and hosts through Avenue 50 Studios, a great venue in Highland Park. It’s a program that brings poetry to the people of the community in non-traditional places, such as a laundromat, taco shop, the local mercado, and so on. Awesome. So what and where is next? Poetry reading in the parking lot of a Home Depot. Remarkable. To Jessica, this one-time-only public platform for sharing the power of the spoken word can and will stimulate intercultural understanding within the diverse population of the North East Los Angeles area. Really, we are floored by what she’s doing with Poesia Para La Gente. We think the entire literary community should acknowledge how powerful this is. Once again, the event at the Cypress Park Home Depot is on May 25th. Facebook event page. Go! And if you can’t, spread the word. Awesome, answers my question: "Who is Writing the Future," – this is coming down the pike, feel it, applaud it, will stand in parade for same. but please let it not become embroiled in delusional self promotion such as the one about the young teen having her "psyche burned forever" by poetry overheard "in the few minutes" while buying some chicle … did anyone talk to that teenager? Allow me, in parallel, to suggest that these "non-traditional" places, i.e. non traditional poetry reading places, can also serve as rich poetry writing mulch … so, if you get my drift, why not invite poets to these places to write about them, in situ or away, and come back to deliver their word images to life?